I happen to believe that backgammon is a great game, just the way it is. From time to time, however, it is fun to change the game up a bit. Here are some alternative ways to play that you not only will enjoy, but you will find them to be interesting learning exercises as well. 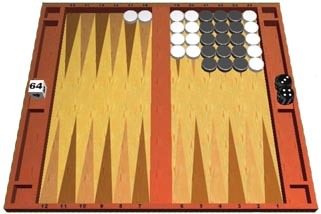 Nackgammon: This is the most popular backgammon variation amongst highly skilled players. When Nack Ballard found that other players were approaching his skill level, he invented an even harder game to prove his superiority over us mere mortals. You start the game with 4 checkers back instead of two. (See Position 1 below.) Nackgammon is generally much more complicated and leads to more back games and double-back games and is very challenging. The Simborg rule: Named after one of my favorite people, this rule is often used in side events at major tournaments. The Simborg Rule states that on the very first roll of the game, the player cannot make a point. Also, if the roll is 6-5, he must not run one checker from his 24 point to the 13 point. The affect of this rule is elimination of the huge advantage that is gained from an excellent first roll. Also, since you now must play rolls such as 3-1, 2-4, 6-1, 6-4, and 5-3 creatively, more blots are left around the board on the opening roll, and that leads to more back games and more complex games. The roll-over option: Each player has the option of canceling out one of his rolls and rolling over, one time each game. However, the option must be exercised before the doubling cube is activated. Another variation is to force your opponent to roll over one time. This option eliminates a major joker early in the game that could completely turn the game in one player's favor. The non-doubles rule: Once there is no contact (both players' checkers are clear of each other), doubles no longer count double. With this rule, where there is a pure race, the luck factor is reduced and the odds of a player who is far behind catching up is greatly reduced. Advance rolling: The game is played normally, except you get to see what your opponent's next roll is before you play. It's a dream come true ... except that your opponent has the same dream! Call your roll: One time, every game, you get to call your roll. So that the call is not a complete disaster, this option must be invoked before the doubling cube is turned. Multiple doubling cubes: We do this in head's up money games. We might have one doubling cube that is worth $1 per point; another that is worth $5 per point; and another that is worth $10 per point. All three cubes work independently. This makes for a most interesting and exciting gambling game. This is one of the most fun and exciting gambling games I have ever played. It often turns out that the big cube gets dropped, but you get to play out the game anyway because the smaller cubes are still in play. It's fun to see how games that are usually dropped turn out. You'd be surprised how often they turn around! Three dice: Roll three dice, but pick your best 2. There are many variations on this. You might only do this once before the cube is turned, or you might only get to do this twice a game. In pure race situations, you could use all three dice, but not have doubles count. And of course, there's the nasty way to play, where you roll 3 dice and your opponent gets to pick which two you have to use. Golf, bowling, and many other games have developed handicap systems so that players of unequal skill can compete. 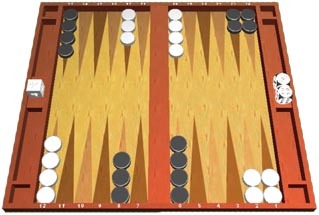 In backgammon, there is no formal handicap system. The problem is that in backgammon, we really don't have a very good method to determine just how good one player is vs. another. The best way I know to gauge the comparative skills of the players is to actually play games and matches on Snowie, or run the matches through Snowie (or Jellyfish or GnuBG) and see what the ratings of the players are. Even that method is not particularly accurate unless you do it many times, as a small sampling of games could be very misleading. Over the years, however, I have employed various handicaps to use when we know each other and want to compete, and it is clear that one player is better than the other, or one player is consistently beating the other. Following are the ideas we have found work best. If you are playing for money, set a stake, but at the end of the day, let the weaker player only pay 75 percent of the loss. If you do this a few times and one player is still losing a lot, you could reduce his payment to 60 percent. Give the weaker play the opening roll. Let the weaker player start the game with an advantage. The advantage might be that his five-point is already made. According to Snowie, this would give him an immediate 10 percent edge in the game. If that works out to be too much of an edge, then start with the bar-point (7-point) or the four-point. Of course, if the weaker player gets ahead a set number of points, the handicap could stop. In match play, give the weaker player a spot. If you play a match to 7, let the weaker player start with 2 or 3 points. Here is my favorite spotthe one my wife and I use. We play all of our games on the computer, using Snowie. We do this so that we can look at our mistakes after every game and learn from them. However, twice every game my wife is allowed to cheat and see what play or cube decision Snowie recommends before she makes her play. I hope some of these ideas will be helpful to you, and hope it will keep you playing more backgammon.